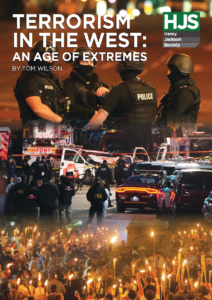 A new 300-page report published on Wednesday by the Henry Jackson Society, Terrorism in the West: An Age of Extremes, finds that for the first time in recent years Britain has become the number one location for terrorism in the Western world. Measuring data collected from terrorist incidents in 2017 against earlier datasets from 2016, the report is able to draw out the key trends as to changing patterns. Breaking new ground, Terrorism in the West: An Age of Extremes outlines for the first time the data from 2017, a year of terrorism that saw troops on the streets of Britain. Accounting for a fifth of all Western terrorist attacks Britain saw 693 people injured or killed by terrorism between 2016 and 2017. 7% of Islamist Assailants were either immigrants or visitors (illegally or legally) to the country they attacked. 8% of Islamists who launched Western terrorist attacks were previously known to authorities. 84% of all terrorism fatalities are caused by Islamists despite recent Security Service reactions to the rising threat of far right terrorism. Military personnel are increasingly coming under attack, with 10% of all attacks in the West having a military target – up from 3% in 2016. Terrorism is up across the West by 9%. The number of terrorist attacks aimed at the UK increased from 5 to 13 of which the number of Islamist attacks increased from 2 to 6. As the UK in particular knows to its cost, there has been a significant increase in the use of vehicles as weapons, with a tripling in the number of attacks involving vehicles between 2016 and 2017. The report also finds that far left and far right terrorism are rapidly rising – albeit from a much smaller base. Between 2016 and 2017, there was a fourfold rise in the number of far right attacks across the world resulting in over ten times as many casualties. Far left terrorism also rose by 55.6%. Both far left and far right terrorism each make up 20.6% of terrorist incidents. Containing detailed profiles on the 68 terrorist attacks to hit the Western World in 2017, the report draws several ground-breaking insights into the changing nature of terrorism. This includes the new pattern of far right offenders emulating or copying the tactics of high profile Islamist assailants. Another is that despite the fall in their territorial control, Islamic State is still connected to over 35% of Islamist terrorist attacks. Report author Tom Wilson, Research Fellow in the Centre on Radicalisation & Terrorism at the Henry Jackson Society, said: “This research highlights the enduring threat from Islamist terrorism. We have seen a growth in terrorism from other ideologies, particularly the far right, but Islamists continue to perpetrate by far the most attacks and are responsible for the vast majority of terrorist fatalities in the West. The evidence shows that Islamist assailants who have had training or combat experience in overseas conflict zones are far more dangerous and on average have been responsible for many more casualties than assailants without such training. You can read excerpts of the report for free here. Or, alternatively, you can purchase the full report on our website here.